Presenting ergonomics solutions as valuable contributions to an organization is critical to getting them accepted, funded and implemented. This article, reprinted from The Ergonomics Report, recognizes that financial measures and predictions are a large motivating factor for any organizations, and ergonomics solutions must therefore be considered in light of their financial impacts. This article reviews the types of outcomes ergonomics can produce; shows how to do ROI calculations that put solutions in financial terms; and promotes an increased awareness of, and focus on, ergonomics performance outcomes, not just well-being outcomes. Note: This article is a modified version of one originally appearing in The Ergonomics Report™ under the title “Calculating Ergonomics ROI; Documenting Ergonomics-Related Improvements”. 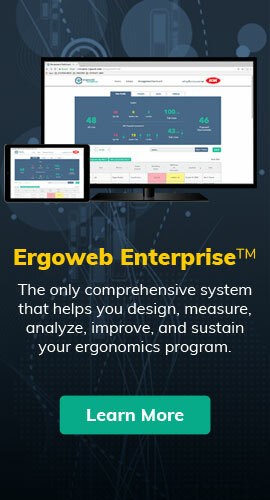 Proving the value of ergonomics is a recurring theme at Ergoweb. We’ve written about it many times since we launched the company in 1995; we’ve taught courses on the subject; we’ve discussed it in conference presentations; we’ve published case studies; and A Strategy for Human Factors/Ergonomics as a Discipline and Profession (Reprint), in which we identified proving value as one of the most important components in our mutual quest to grow the influence and positive outcomes of ergonomics. Will doing X improve our revenues? Will it reduce our costs? Will it save us from punishment (e.g., government regulations, laws suits), embarrassment (e.g., bad publicity), or other negative outcomes? Revenues minus costs equals financial profit, and we’ve all heard phrases like “businesses are in the business of making profits.” Good ergonomics can satisfy any or all of these criteria at one time or another (though it might not be the highest priority opportunity). On the other hand, organizations often add a complex layer of decision making criteria over these primary high level concerns. For example, a board of directors might incentivize company management to accomplish specific goals, such as “launch new product XYZ within the first fiscal quarter,” or “reduce labor costs by 10% this year.” We can debate the efficacy of such initiatives, but regardless of what we think of them, they usually are the overriding force for decision making, especially if performance bonuses or job security are tied to them. Other layers that affect decision making are initiatives like Lean and Six Sigma. When well understood and executed, such systems should map directly back to the four criteria, above. Whether or not they do, they can become the criteria through which nearly all decisions are made, so it behooves us to understand those systems and present our solutions within their framework and terminology. As with any value proposition, the customer must recognize, appreciate, and want or need that value in order to justify any investment. That customer could be an end-user, someone in your supply chain, a production team, your boss, etc. If they don’t already recognize and appreciate the value of an ergonomics solutions, it’s our job to demonstrate and “sell” that value. Performing a cost-benefit analysis is not just a potential tool in our “sales” approach, it is often a requirement before an investment can proceed. There are numerous approaches, and some are very complex, well beyond the scope of this article. Calculating Return on Investment (ROI), sometimes called Rate of Return (ROR), however, is a very common way to help a customer understand the value a proposed solution will bring, and the basic calculations are fairly straightforward. and so on for 4, 5 or more years. Since the time to recoup an investment can be an important organizational measure, ROI is often presented in terms of a payback period. In our simple example, the payback period is 6 months, meaning we will cover the entire cost of the investment, $1,000, within 6 months. In Ergoweb’s experience, ergonomics solutions often result in very quick payback periods, often in months instead of years, which can be a very strong carrot for financially oriented decision makers. Now, just when you thought this really was simple and straightforward, there’s often much more to consider in formal cost-benefit and ROI type calculations. For example, many organizations use Net Present Value as a measure (NPV, sometimes referred to as Net Present Worth, or NPW). NPV calculations take into account things like inflation, and are especially important for investments that have a long-term payback period. If your ergonomics solution has a short payback period, NPV calculations become less relevant. If your customer requires NPV calculations, we suggest either working with them to perform those calculations, learning how to do NPV calculations on your own (beyond the scope of this article), or working with a financial expert. For an example and possible tool to do such calculations, you might visit http://www.equipoisinc.com/roi/, a free tool offered by Equipois Inc. It’s somewhat oriented to their own products, but I believe you can also use it for other purposes. One of the reasons ergonomists are sometimes challenged in predicting future financial benefits is due to a focus only on the well-being outcomes. It’s often difficult to accurately tie financials to things like future injury rates and their costs. In some organizations, it’s even prohibited to do so. Further, even though some may recognize the benefits of outcomes like improved moral, reduced absenteeism and turnover, they find it difficult to accurately predict the financial impacts, and consider them as intangibles — things that are difficult to measure. Financial decision makers typically don’t like to, or don’t have the means to, account for intangibles. Companies do, however, place a lot of weight on measures they are accustomed to, and for which they have firmly entrenched (often to a fault) accounting methods grounded in GAAP (Generally Accepted Accounting Principles). GAAP motivated companies utilize traditional financial measures for things like labor costs, productivity and quality, and anyone who has worked in a production facility knows that these types of measures typically override all other considerations (again, often to a fault). You may encounter organizations, particularly those that are on a true Lean Journey, who use very different accounting methods than traditional GAAP, in which case they may measure value differently, but for most, the focus is on the performance outcomes ergonomics can provide, not the well-being outcomes. To be effective and convincing, you must present the value you propose in the terms to which they are accustomed. Take the time to measure/predict a solution’s impact on performance measures like productivity and quality in particular, because these are already being measured, and driving decision-making, in nearly all organizations. Also understand any incentives/initiatives that are motivating decision making, and be sure to include those components (e.g., if management is concerned about high employee turnover rates, be sure to include that in your ROI calculations). Revisiting the four primary organizational decision-making factors at the start of this article, it’s clear to us that “ergonomics is ‘the right thing to do’,” and it’s clear that there are no direct “punishments” for organizations with poor ergonomics, so if we really want to make an impact, we need to present ergonomics solutions as the right financial thing to do. Focusing more on the performance outcomes that companies are accustomed to, and held to by their stakeholders, rather than just the well-being outcomes, will increase the value of ergonomics in our customers’ minds.